Now that summer is nearly over it's time to assess. While going to the fair is a questionable item in the fitness world, it can mark a beginning on the calendar. Fall is considered by many to be a beginning. 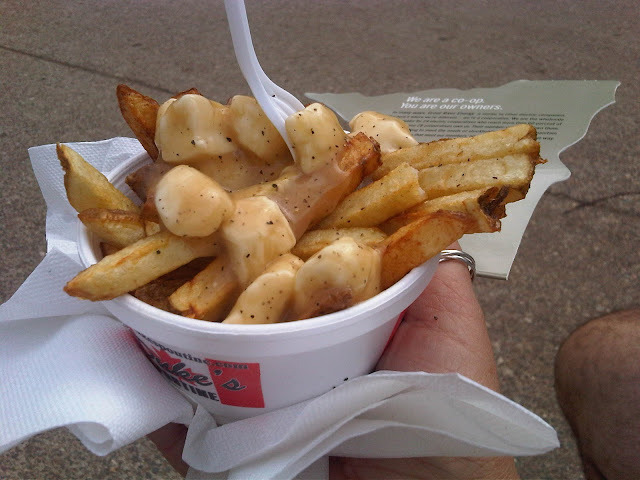 I will eat some Poutine today and a Pronto Pup or two, but I will walk miles and think about the fall plan. What is your fitness plan for fall? Oh, wow. That looks SO YUMMY. Please -- please do -- describe what that is exactly, taste, etc. I have to know. State Fair food, such sweet SWEET memories. Our state fair used to (and still does) make the BEST cinnamon rolls of any I've ever tasted in my life. I think one roll weighs like over a pound? At least a pound? They make the cinnabon place pale in comparison. Lines are always backed up, 24/7 at their booth. People come to the fair JUST to get a cinnamon roll , and then leave. No kidding. What strikes me about your post? You're happy. CHECK. If you're happy, you're happy. Squeeze in good nutrition and/or exercise when you WANT TO. Do we all NEED to? Yes. But until we WANT TO, it is a waste of energy and time. Don't do it solely out of guilt or "expectations." Do what makes you happy. The end.